Neelanchal Krishna Plaza is one of the apartment developed by Neelanchal Build Tech and Resorts. The residential development is located in Bhubaneswar. The project offers 2BHK and 3BHK flats at very competitive and affordable price. It is well planned and is built with all modern amenities. What apartment sizes are available in Neelanchal Krishna Plaza? The project offers apartments sized between 1179.0 sqft and 1663.0 sqft. 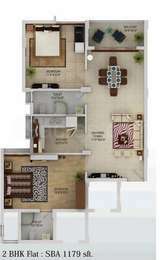 What is the area of 2 bhk in Neelanchal Krishna Plaza? The size of a 2BHK unit in the project ranges from 1179.0 sqft to 1231.0 sqft. How many units are there in Neelanchal Krishna Plaza?There are 130 units available in the project. Does Neelanchal Krishna Plaza have swimming pool? The project has a swimming pool.